My dad and I always spent a lot of time trying to get my mom to use the family computer - with no luck whatsoever. She would try for about a week but would give up because she lost interest. Last Christmas, my dad got my mom a MacBook and taught her how to use it. This time he decided to show her how she could keep in touch with her kids by viewing our online photo galleries and emailing us. She took much more interest and I've been working to keep her using the computer ever since. Dad got her set up with a Gmail account, and I've been emailing her quite a bit with links to sites I think she'll like and other little tidbits for her to do on the web. 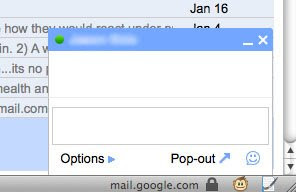 Today, I noticed that she was online checking her email when I saw that her little Gchat icon was green. I decided to send her an instant message. She seemed a little confused at first as her "typing" status stayed up for a long time. Eventually, she hit Return and the longest IM I've ever received appeared. She was obviously still thinking of it as email. She quickly caught on and we had a short little conversation. By the end she was IMing like a semi-pro (no abbreviations or emoticons). However, my favorite moment came as she was signing off. She wrote, "This is a neat little square."